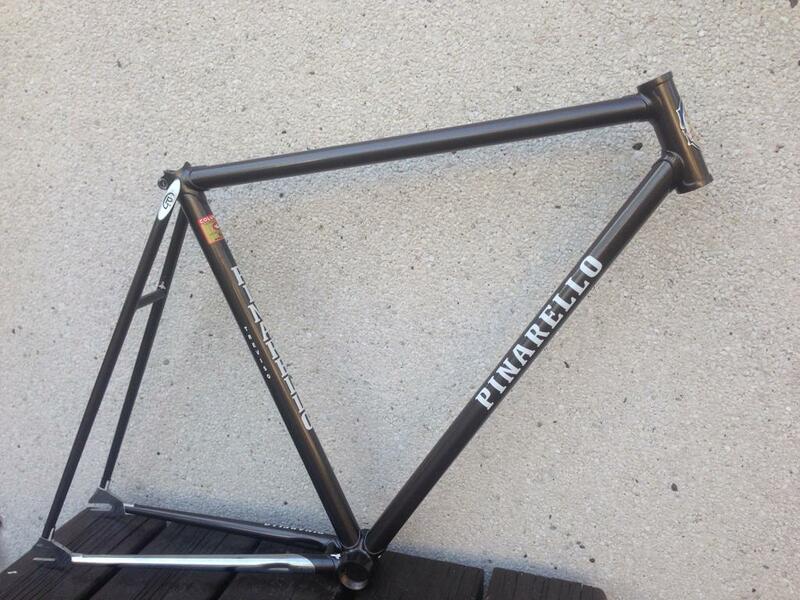 I just happened to find this beautifull and small (52x52) Pinarello Pista frame for me. I just need some identification help with it. Frame have been re-painted and decaled. It’s a defenetly Pinarello, but what model, what year and what tubing it might be? It is not SLX as the sticker says, but it sounds and it is bit lighter than my old SL tubed frame. Takes 27.2mm seatpost. Came with nice chromed unicrown fork with pantos. Bare frame weight’s 1780g and fork 660g. Can someone help me with this? Good guesses? My guess would be a Pista Amatore around 85-86, SL tubing. Both the 85 and 87 catalogues specified SL tubing for their track frames. The 87 model had a chrome rear triangle, where as the 85 is painted like yours. I’ll check where the serial number sits when I get to work - those double letter numbers are typically mid 80’s. ^ Yeah I’ve got two Montello serials with the DD prefix and they’re from 1985 or thereabouts. Whatever it is, it is very nice! This and I’d love to see a pic of the whole frame. Yes, this is true. It just would be nice to know more about the frame if it is possible, but in the end it dosen’t matter that much. Many Amatores I have seen have had Gipiemme dropouts, but maybe they have just used what they have available at the time. Also I think that this unicrown fork is more comnon on Bassano Pista’s but who knows. Also many 80’s road Pinarellos got same type of fork so it is defenetly from the 80’s. Maybe 1985 or something from that area like P!N20 said. - Thanks! Also it might just be '87, but tho the rear end chroming is different. But this frame have been re-painted so I can’t know is the rest of the rear end chromed under paint. Also I notiched that I can’t see all same engravings in the '85 catalog picture, but the '87 Bassano looks about the same with engravings. And I also think that the tubing is Columbus SL as Pinarello seen to used in the 1985-> quite often on their Pista frames. Oria tubing would be heavier and Aelle too and it isin’t SLX so it kind a leave only the SL. I can’t complain. SL is good quality tubing and the size is perfect for me. I did get this pretty cheap. What this would be worth? I’m not selling it, but it is nice to know. The fork on the Amatore in the '85 catalogue is from earlier models, I doubt they would have kept that up for long - your fork is more typical of the mid 80’s era. It’s worth whatever you paid for it. Did you find this out in the end? Slightly different number / letter combo on the fork. Mines a 1Z 346. Anyone have an good guesses on the age?! ^ Throw up some photos! The BB letter is likely an L. Difficult to distinguish but that’s the best bet… Any ideas!!! I just took the .html out of the image address but it didn’t work. No idea why, but I don’t understand computers.